Discussion in 'Epson InkJet Printers' started by Tyler Pickering, Jan 2, 2019. What do you guys recommend for making sure my printer stays in good printing condition for as long as possible? I am printing quite regular and with varying types of media. My printer does not use cartridges but rather has tanks with which you just pour ink in. Do you guys think there is a difference between genuine ink or am I ok using 3P ink? 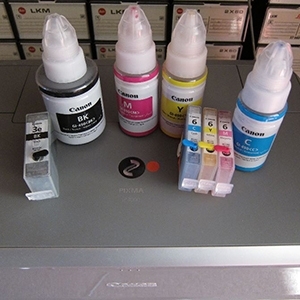 The longer term permanence of the inks - fading by the sun or ozone can be a problem, 3rd party inks are more prone to such effects , but even the Epson ink coming with most Ecotank models is not so much better in this respect.Use the Epson 106 inks instead for the ET-7700 if long term permanence is your concern. You never may see such effects with your inks. it is typically a box which is held with one screw at the bottom of the back side. If you need some more info from your printer you may run the status report of the WICReset utility e.g. pages printed, error conditions, status of the waste ink bin. get odd printing problems, double characters and alike - that may happen after 20 000 pages or later - it depends. There is not much beyond that I could tell you - just keep it printing. I'm doing 50- 80 000 pages with similar models like the L382 currently or L310 earlier. Thats an interesting discussion on the 3P inks causing that banding and I think maybe that is what I what experiencing as it would come and go without anything looking off in nozzle check. Now I see too that even though your nozzle check might not look like its missing any of the lines its possible for the lines to be in varying states of thickness. Truth be told I never knew printing and the intricacies of the ink and setups was such an art. Learn something new everyday I guess! Yeah there is a small piece missing when I printout the nozzle check. It is always the same cyan piece when I get this issue. A head cleaning seems to resolve it for a little bit but as soon as I get to printing the reverse sides of a 50 page print job it appears again near the end of the print job. There was originally epson inks in there but I added 3P ink a few days ago. I don't know if they mix together or one sits on top of the other but the issue happened even before I put in the 3P ink. This is with the new printer I should mention. If I print using standard vivid instead of standard I dont get the issue and if I use cardstock and presentation matte settings there is no issue. The only time it acts up is when I print with factory settings on regular paper with the basic printing settings with nothing changed. This is also a new issue I printed 3000 pages without it happening but did run a head clean because I got some banding in few colors after 2000 or so but then this issue seems to be regular now as of yesterday. Interesting indeed, I think there are several variables we don't have much control over, you are most likely out of the range of typical printload for this printer model, but it is performing quite well nevertheless. There is one variable the user cannot control directly and independently - the droplet size - piezo printheads allow quite a wide range depending on driver internal settings - in relation to the quality settings and paper selection, I just don't know if the printhead runs with 3 or 5 or 10 pl per shot. The droplet size should have an impact on some side effects at the nozzle edges - more ink - more satelite droplets - more ink causing (temporary) deposits at the nozzle edges and on the nozzle plate, those may just be temporary and can be cleaned/wiped away. And all this as a physical effect is dependent on the surface tension of the solvent. I'm observing an effect with Epson printers - the printer does a kind of cleaning action after a heavy print job - probably wiping off the nozzle plate with the pump running, but the printer, the driver, the firmware does not break a print job in between for such action - it makes a difference if I print 100 images in one print job or split it in two and start the 2nd half after a short break - with this cleaning action in between. You may give it a try and see if you can observe such effects as well. And there is still the question whether the ink - 3rd party or genuine - does have an impact on it or not. I guess another thing I have noticed when I have this issue is I actually do get droplets sometimes in the images on the paper I'm printing on. I'd prefer to print at the faster setting and in non-vivid as I am printing rulebooks and it isn't necessary to have the best color for them but the lines are more of an annoyance than a dealbreaker as they are only in the supplemental images accompanying the text. I'm going to play around with the settings and see what works best. You are using the printer for faster throughput than I do , I'm printing photos, albums, image collections on A4 on glossy paper, with the matte paper setting and fine quality, this mode uses the black ink as well. Such print jobs take their time but that's o.k. Another follow-up to some of the issues I was having with quality using the presentation matte setting is that I was getting washed out colors and not having the same definition as I was getting before with the same printouts. I ended up going back option through option and making sure I was set exactly how I had it before and lo and behold high speed printing was turned on. This option for whatever reason has some serious issue using the presentation matte setting and was the root of my problem this time.